Nose cone - leading section of the rocket, with the job of reducing aerodynamic drag. Payload - section of the rocket which carries the cargo to be delivered. Body tube - central structure of the rocket, the body tube holds the engine and provides a mounting point for the fins. Wadding - when the ejection charge forces the parachute out, this protects the parachute from being burned. Thrust ring - holds the engine from shooting through the rocket. Parachute - when the ejection charge ignites, the parachute is forced out & slows the rocket's descent to avoid damage. This is one of several possible "recovery devices". Streamers are also used, which are long pieces of crepe paper which provide enough drag to slow the fall of a light rocket. Other devices include helicopter-like propellers and even glider wings, all of which are ejected or extended by the ejection charge (see below). Shroud Lines - suspend the rocket from the opened parachute during descent. Shock cord - elastic cord connecting the body to the nose, which in turn is the anchor point for the shroud lines. 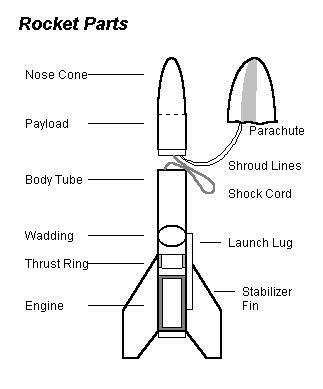 The shock cord prevents a sudden jolt to the rocket when the parachute opens. Launch lug - small tube that goes over the launch rod and guides the rocket at launch. Stabilizer Fins - take over guidance of the rocket once it reaches high enough speed for the airflow over the fins to provide a stabilizing force. Note then that the rocket needs to be up to speed by the time it reaches the end of the launch rod or it's flight will not be stable. The thrust of the engine must be not only enough to lift the rocket, but enough to accelerate it to about 30 mph by the end of the launch rod (about 36 inches of travel). Retainer Cap - holds in the ejection charge until it is ignited. Ejection Charge - forces the recovery device out (recovery deployment) at apogee. 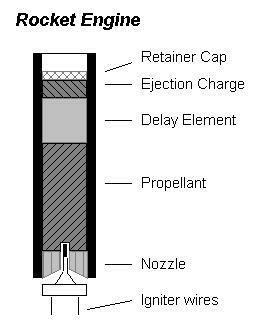 Delay Element - provides time delay between propellant burnout and ejection charge ignition so recovery deployment occurs at apogee. Also provides smoke trail to help track the rocket. 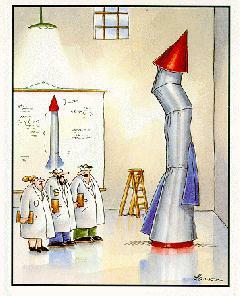 Propellant - chemical compound which, when burned produces thrust as it escapes through the nozzle. Nozzle - forces engine exhaust gases through a small hole in a ceramic disk - forcing the gases to move faster which improves the engine's thrust. Igniter wires - ignites the propellant through remote control.